If you make a small donation to the Arbor Day Foundation, they send you 12 tiny bare root trees and bushes. 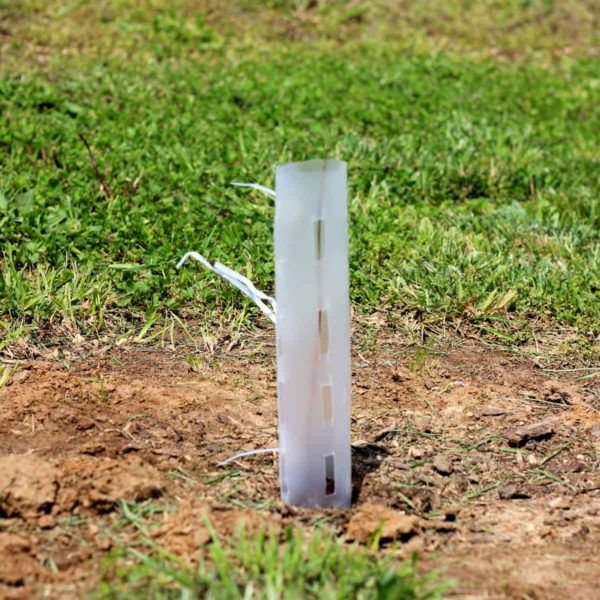 They carefully choose trees that will grow well in your area. You’re supposed to plant them, and then the Foundation plants 12 trees in a place that’s lost trees to wildfires or similar disasters. I made my donation, and the trees arrived the next spring, at the best time for planting. 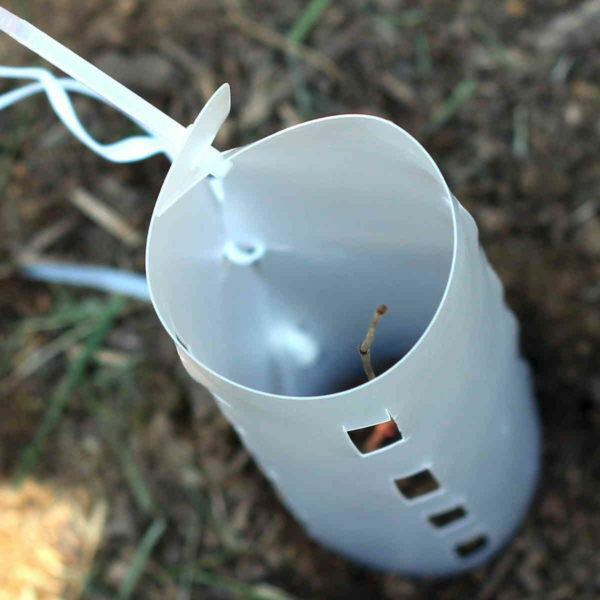 I saw this as a cheap way to get some trees started in my bare yard, and also great for the environment. Trees help to filter greenhouse gases from the air. Most of the trees I got also produce berries for birds, butterflies and insects. 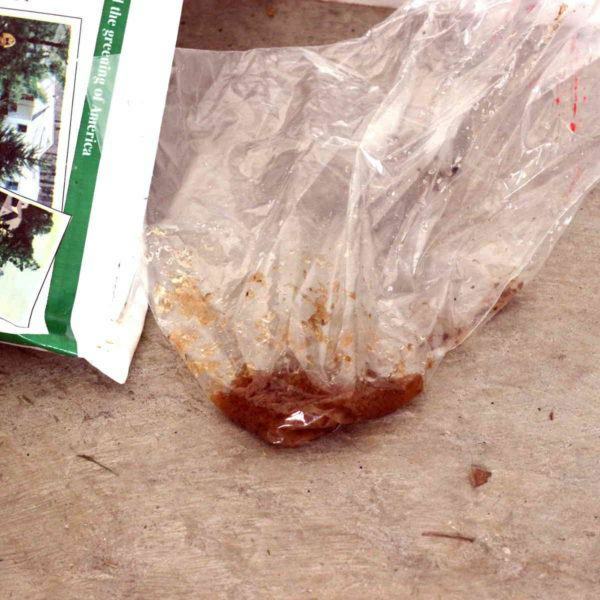 Inside are twelve “baby trees” which look like twigs and have their roots in a bag of gel that preserves them in a dormant state. If you’re not ready to plant them immediately, there are instructions for how to keep them alive. But I planted mine within a few days and they were fine just hanging out in the gel pack. 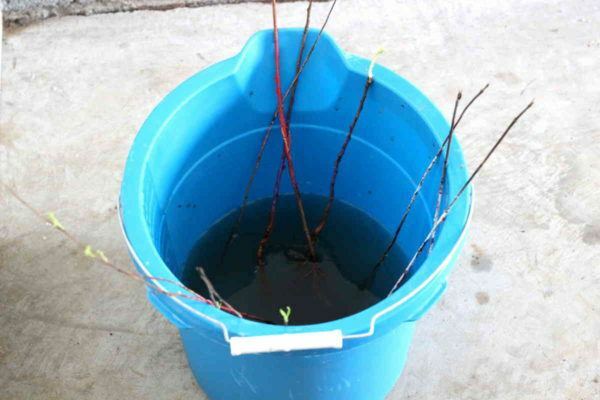 The day you’re going to plant them, you take them out and soak the roots in water for 3-6 hours. That gets the gel off. I ended up leaving mine longer because while they were soaking, I was digging holes, ran into issues, had to rush out to a hardware store… more on all that later. You get a variety of trees, and they paint the bark (not harmful) and give you a color code so you know what you’re planting where. (Note: my “redbuds” turned out to be dogwoods.) Consider how big the trees will get and don’t put them close enough to fall on the house. You also need to consider what the tree needs in terms of shade and space to grow. And be sure to call 811 to find out where utility lines are. I got some dogwoods which like partial shade, so I planted them on the only side the house that gets much shade. Crab apples and crepe myrtles, which won’t get that big, went near my air conditioning units. By shading the units, you can cut down your cooling bills. I planted Washington hawthorns in spots where they would provide shade and privacy for the house. 2. Put the tree in the hole and gently add top soil. Now, here’s where I had to adapt the Arbor Day instructions. 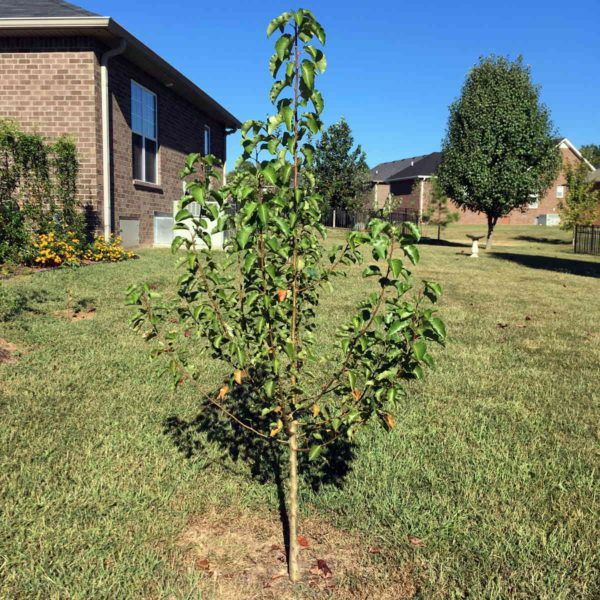 They recommend planting each tree in a 3 foot diameter hole, in a “garden area”, and then in a few years transplanting it to its permanent home. But I have a 1/3 acre lot, so there’s no room for a “garden area” that big. Also, the ground in my yard is really tough – clay, no top soil, all weeds and no grass. Digging twelve 3-foot holes would have taken me days, and what was I going to do with the trees in the meantime? Here’s what I did. Top soil – if your yard has good, rich dark topsoil already, you may not need to add much. My yard is just clay, so I went through four 40-lb bags, and if I’d dug the three foot holes as they recommend, I’d have needed probably twice that much. Shovel – you want a spade-shaped, pointy digging shovel (see these examples) to get through the tough earth. 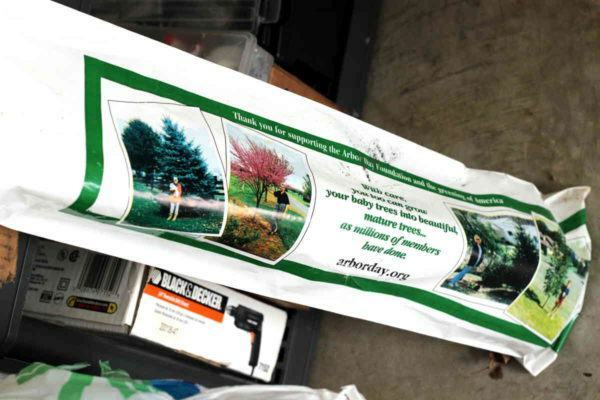 Mulch – I went through 3 bags of mulch. Note: very young trees cannot tolerate potting soil, chemicals or fertilizer. Don’t use these products on them. Dig holes at least a foot or so in diameter. Shovel out about half the earth in the hole. 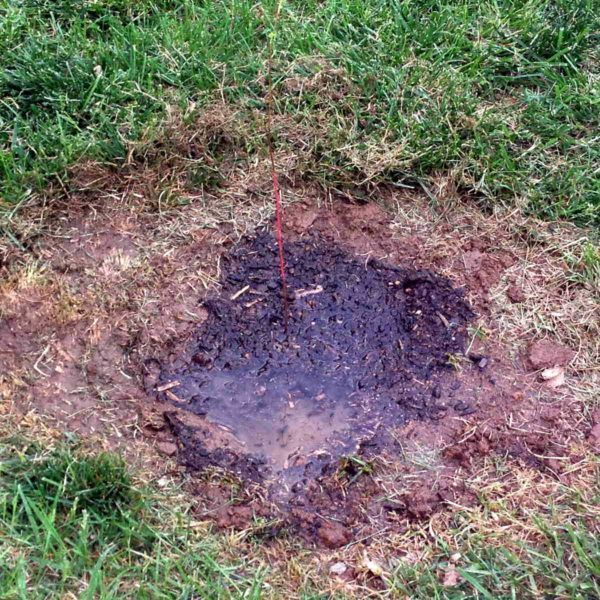 If the tree has long roots, be sure to dig the hole plenty deep enough to cover them – most of the holes I dug were 8-12 inches deep. Position the tree, roots down, in the hole. Gently pour or shovel top soil in around it. It really helps if you have someone who can hold the tree steady for you, but if not, just use a trowel to add the top soil bit by bit. 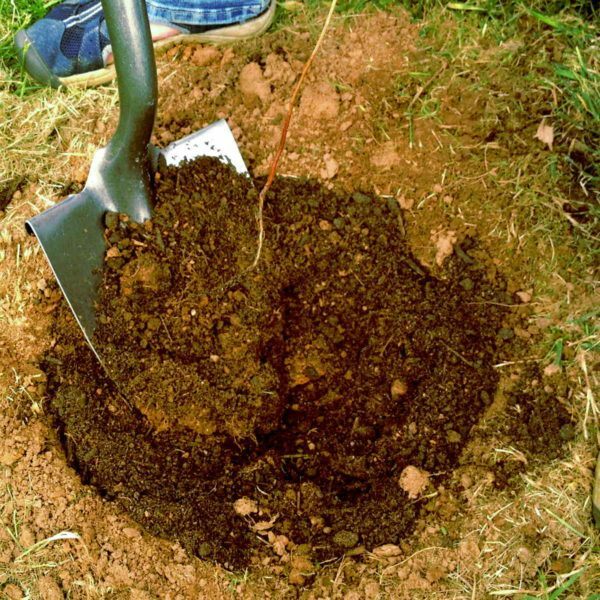 You can also pour in the top soil first, then shovel some of it out of the way, then put the tree in, and finally gently tip the shovel to let the top soil fall back around the tree. 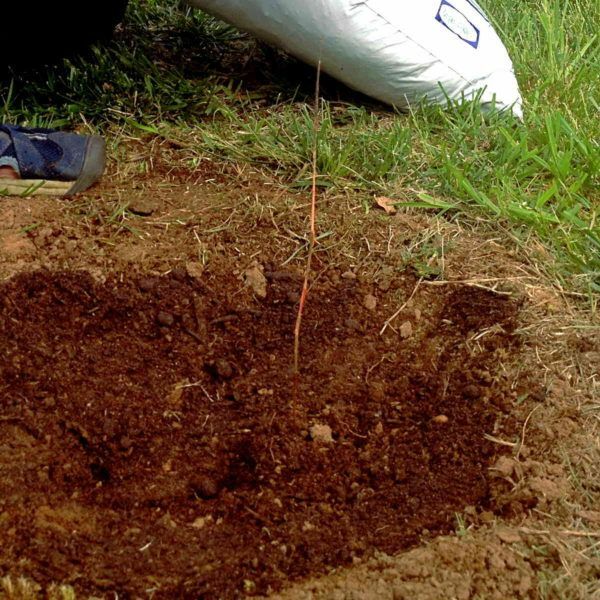 In the end, it should look like this – an upright tiny tree in a nice pile of top soil. Before I could get to this step, a heavy rain started falling – completely contradicting the weather reports – and took a day and a half to pass. A couple of trees got snapped in half, and that’s exactly why this step is so important. (The rest survived just fine, and I’m hoping the ones that broke will grow from the root despite the breakage.) 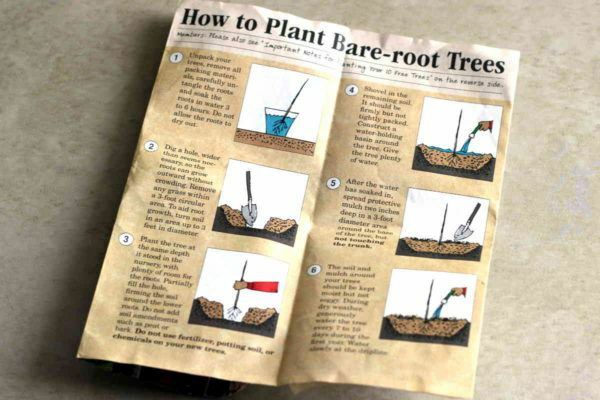 The Arbor Day guide doesn’t mention this step, but their catalog does. …and then tie it to the stake. I used twist ties and zip ties. Sorry about the focus in this picture. The final step is to give the tree a good watering and then put mulch around it. Now, whoever landscaped my neighborhood piled mulch in a heap right up to the tree. This is wrong – it can cause the roots to grow level with the mulch instead of with the ground. 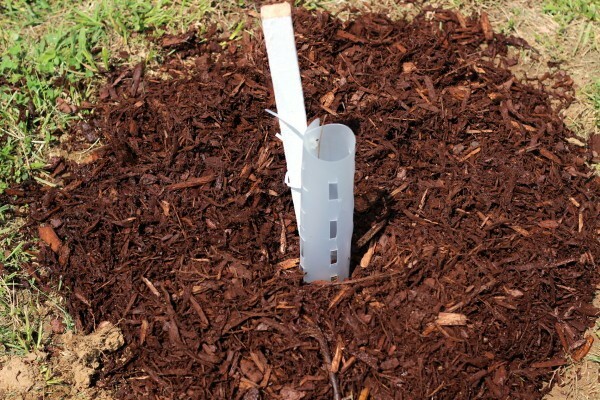 You want to make a big ring of mulch, a couple of inches high and at least a couple of feet around the base of the tree, but not right up against it. I’m not sure how easy it is to see this in the picture – the mulch ring is shaped like a donut, and because of the protector, it doesn’t quite touch the tree itself. Get the ground around the tree good and moist. If you use a garden hose, put it on a gentle setting, even a misting one. You don’t want the water to unsettle the dirt; you want it to soak in. In the end, you should have a little puddle. Now add the mulch around it. After that, you just want to ensure the tree gets plenty of water. During dry spells, water it every 7-10 days. As mine grow and I see what they need, I’ll share more tips! Hi! Great work! 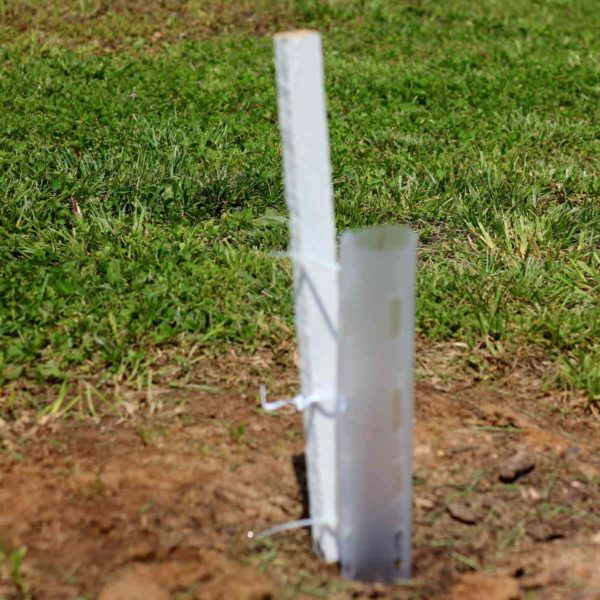 Did you make your own tree protectors? What did you use? I did! These were plastic or silicon placemats I found at Dollar Tree, and then I cut the holes in them myself. Looking back, I’m not sure the holes were necessary – the trees outgrew these protectors pretty fast. Then I got some chicken wire and just wrapped pieces of it around them.